An inquiry into a missing eight-year-old boy from Bristol is being treated as child abduction by police. Angelo Jurado-Marmolejo was reported missing when his father, Rafael Jurado-Cabello, did not return him home after a pre-arranged visit on 2 March. 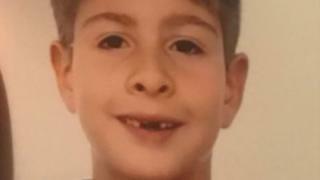 Police said Mr Jurado-Cabello, a Spanish national, was "now in breach of a court order and is wanted on suspicion of child abduction". They said they believed "Angelo may have been taken abroad". In a public hearing at the Bristol Civil and Family Justice Centre, it emerged Mr Jurado-Cabello had previously abducted Angelo after a half-term holiday in February 2017. Angelo was returned to his mother in March 2017. A family court earlier this year ruled that Angelo should live with his mother and spend time with his father. Judge Nicholas Marston told the hearing earlier that Mr Jurado-Cabello had lost two family cases where he had tried to persuade the court that Angelo should live with him. Angelo's mother Karol Marmolejo has also released a statement which refutes claims from Mr Jurado-Cabello she had given him permission to move the boy to Spain. Judge Marston said: "This is a very serious matter. The oxygen of publicity is an advantage, not a disadvantage in this case. "I want to stress that although the parents are not from this country, Angelo is a little Bristolian boy." Police said Angelo "lives full-time with his mother" in the Whitehall area of Bristol and goes to a local primary school. Det Insp Matt Lloyd from Avon & Somerset Police said: "Our immediate priority is to locate Angelo. "We believe Rafael Jurado-Cabello may have taken Angelo abroad and we're making further inquiries with the Spanish authorities to locate him as soon as possible." Ms Marmolejo said: "His older brother David and I are desperate to have him home. We miss the morning cuddles he asks for every day. "Angelo will be missing his family, his friends and his school, and we are very worried about him. "We have no information about where he may be, or how he is, and we'd ask anyone with information to call the police as soon as possible." Mr Jurado-Cabello is described as white, 5ft 6ins (1.67m), slim, with black hair. Angelo is described as white with short wavy dark brown hair, dark brown eyes, 4ft 4ins (1.32m) and was last seen wearing a zip-up fleece, dark trousers, red training shoes and carrying a blue rucksack.